Place Your Order Here to get on the List to get the next scarf in the Progress of being Knit. We'll email you with an approximate delivery date. The Original Scarf that is in this photo is 16 foot and has been sold, but more are on the Way! 53 stripes of 7 different Wool colors carefully matched to the Original pattern for the Dr Who Season 12 Scarf in colors and stripe sizes, in the 15 foot, the other lengths start with the same stripes as the original, but end at the chosen length. Hand Knit By Sharon Nani, knit designer, writer, teacher with over 30 years experience, and sponsor of The Little Knitters Program. Our scarf is a Hand Knit Wool Garter Stitch replica of the original Scarf which was knit by Begonia Pope in hand knit garter stitch made of Wool Yarn for Tom Baker when he was cast as The Doctor for the Dr Who TV Series. Note, in all cases throughout this product Description the name "Dr Who" is copyright of BBC and in no way is used to imply any affiliation with BBC. 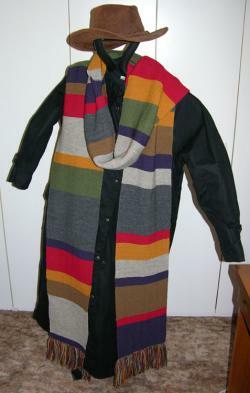 It is only used as part of the product description of the Reproduction of a Dr Who Style Scarf. The Scarf in this photo was hand knit by Sharon to teach The Little Knitters the hand knitting techniques and design process. A Little KnitterÌs challenge from a Doctor Who fan to knit a replica of Tom BakerÌs Season 12 Doctor Who Scarf started a great knit learning adventure. It initiated the design and knitting process by inspiring the Little Knitters to research the knit project for correct yarn fiber, yarn colors, and yarn stitch construction. The next step, was teaching The Little Knitters the task of Drafting the knit pattern to come up with the right size for the 53 stripes composed of 7 different colors of pure wool in this garter stitch scarf. As a result, Sharon wrote the article which can be found on her web site: "Learn To Knit by Hand or Machine ~ Doctor Who Season 12 Scarf Replica" showing the knitting techniques to inspire other Little Knitters to keep the craft of hand knitting alive. 135 Hours of Loving Knitting goes into the 16 foot Scarf! See close up photo pictures of the entire knitting process of The original, first scarf from cast on, hand knitting the garter stitch, binding off, weaving in the yarn ends, adding tassels, steaming and hand pressing. Click Here is see the article and follow all the links under Instructions to see the Basic Knitting Techniques and all the CLOSE UP PHOTOS OF THIS SCARF ~ Read the whole article to follow the whole knitting experience of The Little Knitters and encourage Little Knitters of your own! Submitted by Emailed in Review on Fri, 08/09/2013 - 20:11.